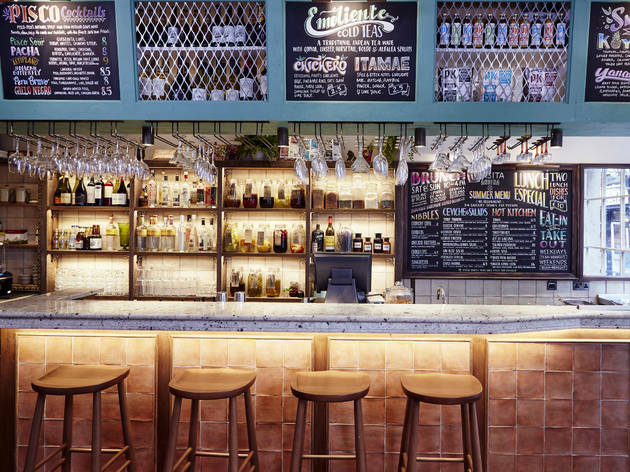 A homely Soho townhouse from the people behind Ceviche and Andina. Just in case your GCSE Spanish is a little rusty, ‘casita’ means ‘little house’. And Casita Andina is just that: a little house. Specifically, one of those Georgian townhouses in Soho, where the rooms are small, the windows tall and the floors all stacked on top of each another. Being from the same people that gave us Ceviche and Andina, it’s got a laidback, Latin kinda vibe. By day, it’s serene and relaxed, with the best seats on the first floor (high ceilings, heaps of natural light). By night, there are no bad seats. The ground floor melts from buzzy (up front) into intimate (at the back), while the shindigs sit on the vibrant first floor. This is also the entrance to what is officially my favourite new ‘hidden’ spot: a tiny, three-table terrace with turquoise-painted walls, atmospheric lighting and fronds of swishy potted plants. All under the cover of a practical, retractable awning, because, let’s face it, we’re still in London, not Lima. As for the menu, you can’t mistake its parents: it’s a little bit Ceviche (cold cured fish) and a little bit Andina (wholesome superfoods). 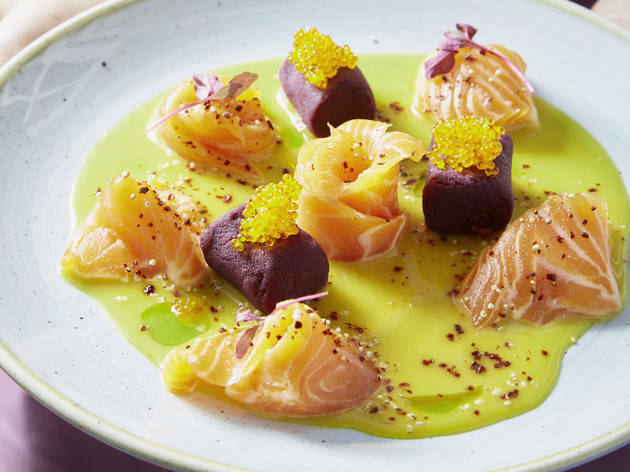 I have a particular soft spot for the signature ‘ceviche casita’: a pretty tumble of glistening seabass with avocado, red onion, sweet potato and the crunch of toasted corn, all offset by its zingy ‘tiger’s milk’ marinade, this is a summer holiday of a dish that you could eat whatever the weather. From the ‘hot kitchen’ came the warmer-uppers: a trio of fat, juicy king prawns luxuriating in their own spiced seafood stew; a daringly pink stack of lamb medallions. 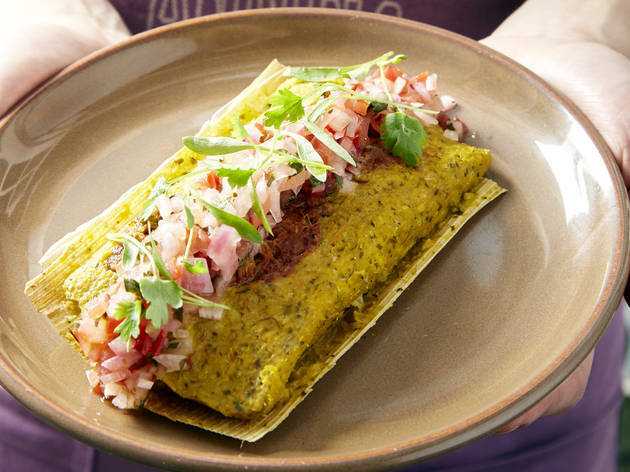 But if it’s comfort you’re after, you have to try the pork tamal. This is essentially a steamed corn ‘dumpling’ in the shape of a giant, squidgy sausage. The starchy outer has a sweet, subtle flavour; slice it open to reveal its meaty, fiery, tender pork middle. It’s ugly, yet strangely beautiful. But it’s not always fiesta time in this casita. On the night of my visit, the kitchen’s use of powdered panca chilli (with its low-heat but high-intensity ‘roasted chilli’ flavour) was heavy-handed, overwhelming the otherwise delicate flavours in a vegan dish of crunchy cauliflower, sweet potato and broad beans, or a bowl of battered avocado chunks. More attentive service would be nice, too: my drink wasn’t refilled once. Then puds arrived and I forgave them instantly. There’s intriguing whipped avocado (think of it as a substitute for cream), served in a glass with strawberries and spindly sticks of sugary meringue. Or the must-try ‘choco-sauco’. A rich, decadent sphere of chocolate mousse, it comes with intense elderberry gel, crunchy cereals and popping candy. Forget ending things with a bang: what you want is crackle-crackle-crackle. We had a pleasant meal, cute little restaurant. The staff were lovely and the food very tasty. The winner was the desserts, the best part of the meal. Nice staff too. Would go back but wasn't raving about it! I can't quite put my finger on the exact reason, this place was good, yet kind of forgettable. My friend and I questioned if it was because we were spoiled by other ceviches restaurants we had been to before, which were better. Or was it because the service was a bit anonymous - not rude, not unfriendly even, just unengaging in any way. Or maybe the fact that, as mentioned below, there was very subtle, up-selling throughout the evening. So much so, that we quickly declined another glass of wine, as we were still sipping ours and had finished all the food, with the full intention of heading to the pub, only to be abruptly be told our table was needed back, just ten minutes later (no warning). Good job we didn't order and then have to down it! Classy. The place is cute, the atmosphere was cosy and some of the dishes were very tasty (the tuna was our favourite), but for £50 a head (with shared dessert), one cocktail and one glass of wine each, it needed to just have a bit more of a wow factor. Visited this restaurant with "Timeout Table for Two". Didn't have a reservation but didn't have to wait. Great atmosphere (altho it is crammed on the 2nd floor) and really attentive service. Can't say I would recommend the food though. The ceviches were so incredibly sour without something to counter balance - very different experience from having ceviche in the Andes. We were delighted to see so many vegetables featured as heroes so we ordered a lot of them - but neither the corn nor the aubergine were standouts. The pulpo (octopus) was fantastic - and perfectly balanced across the char/acidity/sweet/spice so maybe we should have stuck to the non-veg offerings. I had high hopes due to the hype around Casita Andina, particularly it being one of Soho's 'best new restaurants'. However it was quite a disappointment. Service was poor, I constant felt our waiter was trying to up-sell at every interaction with us. When he tried to get us to order desserts, we actually agreed, yet he forgot to give us dessert menus, and after sitting around waiting for long enough we decided to just get the bill instead. We ordered some beers which were also forgotten about and had to remind the waiter of. In terms of food, the Ceviche Andina, the signature dish of sea bass ceviche in tigers milk was excellent, I highly recommend ordering this. The octopus and lamb dishes were also very good. Scallops were lacking any flavour and the croquettes were disappointing. Therefore a very varied experience with the menu. The seating is very crammed in, I understand the whole homely feel they are trying to go for, but homely should be comfortable and the seating arrangement was not. Ceviche (another Peruvian restaurant owned by the same group) is much better in my opinion. I want to give this place five stars but the food to price ratio is just so poor. Service is also middling. I was here last night as part of the Times Out voucher special, which included a drink and three ceviches for a tenner. You are not told however what drinks and ceviche is included which is just odd. Nor was I provided a menu when I was seated. A pisco arrived however, shortly after and it was DELICIOUS: frothy, sweet and potent. The ceviches as it turned out included a pork one which I couldn't eat as a pescatarian. When I told the waiter, he looked at me blankly and then said "You'll have to ask" when I asked to switch to a veg option. But he turned away as I asked, "who do I ask?". Uhhhh ok. Thankfully another waitress whisked it away and replaced it shortly with a veg option. All the ceviches were therefore delicious but SO tiny. I also got a side of the aubergine fries- whilst the honey sauce is divine and the fries are not too crispy and delicious- again that serving size is so tiny even 3 quid is a crime to pay. No server asked how my food was, did I want anything else, etc. I noticed the table next to me that did not have a voucher for more attention, which speaks poorly to staff training. Too much money for small portions. I've been to other restaurants in the chain and thought they were great but really disappointed with this branch. As soon as they caught sight of our timeout offers voucher they treated us like crap! They suddenly decided we could only sit in the front area when we'd already waited 40mins for a table, so we had to wait even longer until a table there became free. This wasn't specified on the voucher. Nor was the fact you could only order three specific ceviches so no choice. These were smaller portions than the normal menu but still great value for this and a pisco sour for a tenner. I would have recommended the voucher if we had not been treated like cheap skates by the staff for using it! They should not sign up for Time Out offers if they do not want people to use them or at least include all their terms and conditions to manage people's expectations. Really enjoyed this restaurant the first time I went, which was a few months ago. We sat at the bar downstairs, and really enjoyed the atmosphere in that part of the restaurant. Food was great, and oh those cocktails! Best pisco sour I've ever had. The second time I returned was with a voucher, and we were sat on the second floor, which felt quite crammed and definitely didn't have the same atmosphere as downstairs. Also, we were asked to leave our table after 2 hours for another booking, although we hadn't been told that this would be the case when we sat down. I've still given it 4 stars though, because I enjoyed it so much the first time! And I would go back, just not with a voucher. If you were to ask me what Peruvian food tasted like about six months ago, I wouldn't have had a clue! But I am so glad i've discovered its excellence and that it was at Casita Andina. I don't have anything bad to say about this cute, cosy and downright delicious Peruvian in Soho. Being pescetarian, it makes for the perfect selection of fish and veggies, as well as being nutritious and absolutely packed with superfoods. The ceviche (cold cured fish) is fresh, bursting with flavour and absolutely beautiful to behold. I've already booked to revisit again soon. If you're lucky enough to pay this place a visit, don't leave without trying at least one Pisco sour - Peru's national cocktail. A nice and cosy restaurant, with lovely and very accommodating staff. The menu makes you want to go for everything, and it's a good thing as it suggests to order 3 to 4 dishes per person. We went for a mix of cold and hot dishes and a couple of desserts too because... why not! The cold fish dishes were as colourful as their taste was sharp. The hot meat dishes were absolutely fantastic, especially the pork belly - I recommend 100%. Chocolatey desserts were also very good and surprising with a sort of corn-chocolate sticky pudding or fizzing souffle rice. An unusual and interesting experience in Soho, Peru - suitable for all occasions! 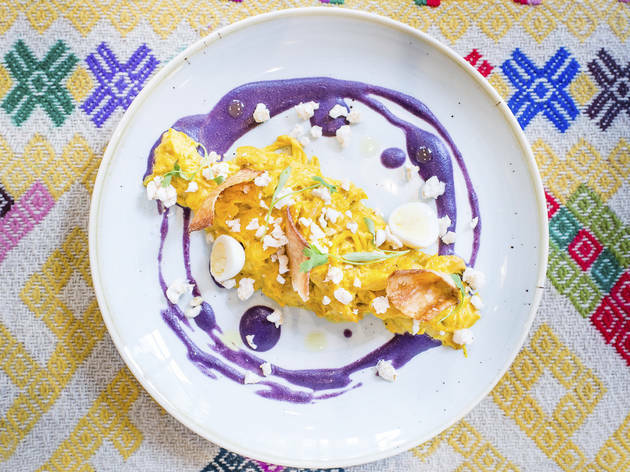 I really enjoyed my visit for Andina before (and all other Peruvian restaurant I’ve tried in London), so I was expecting similar level of satisfaction form its little sister. And in terms of food, I wasn’t disappointed. The Ceviche Andina - raw seabass cured in tigers milk (citrus marinade) topped with red onion, coriander and crunchy corn bits, was generous in size and absolutely aromatic. From the hot selection, I tried Puka Picante – heritage Peruvian colourful potatoes with raw yellow beet and red, beetroot panca sauce. It had a nice kick of spice, was full of flavours, but the potato chucks were slightly too big to be eaten with a spoon. The only slightly disappointing dish was Chupe Seco – three king prawns in creamy seafood stew, served with a squirt of sweet potato puree, queso fresco, little piece of giant corn, and a quail egg. The prawns were tender and tasty while the corn was blunt, but as the elements of other dishes were perfectly coming together creating coherent whole, this dish just doesn’t work. It seems as if they needed to fill out the menu and created a dish from whatever leftovers there were at hand. Both desserts were delicious. I opted for Flan de Quinoa - cute egg custards with pisco-infused dry fruit, delicate crackers and burnt caramel sauce. Having tried their pisco selection before, we decided to try the intriguing sounding Andean cold teas. Made with roasted quinoa, linseed and herbs, my Itamae – with matcha green tea, plantain powder, ginger and lime juice had a look and taste of a healthy green raw juice. It’s wasn’t very pleasant, but still, it had a very distinct and unusual flavour. I’d much more recommend Chicha morada - made form from purple maize, it was far more tasty. On the down site, the tables are really small (too small to have a few dishes to share on one table) and are only about 10 cm away form one another. It’s very lively and loud to an extent you can’t hear the waitress. The waiting time it also slightly too long for my liking. I understand the concept, lean back, relax, share the food, converse, but I found it quite hard to relax and have a conversation in this environment. If you'd asked me if I liked Peruvian food a year ago I wouldn't have had a clue. Since then trying Andina and now Casita Andina, the answer is: I'm in love! In the heart of theatre land I am delighted to find a truly nice restaurant, with outstanding service and delicious food. Unlike a lotta small, popular restaurants you are able to book which is a big bonues as I will be going back again and again and I don't want to have to queue! As soon as we were seated we were served by a passionate and knowledgeable waiter who offered us plenty of recommendations and explained the concept (sharing plates that arrive when they're ready - for 2 people it was suggested 6-8 plates). It was the first day they'd moved over to their Autumn/Winter menu so my online perusing the week before had turned out to be wasted however this seasons menu looked (and was) equally delicious. Some stand outs included the avocado fritters, maca lamb loin and croquetas as well as very sweet but yummy traditional drink called chicha morada which is made from purple maize. We were pretty full as most of the portions are very reasonable so we didn't get dessert however they also looked very bright, different and full of flavour (a quinoa egg custard and steamed purple corn humita). As with all the restaurants that serve sharing plates the bill does seem to stack up quite quickly and with no dessert or alcoholic drinks it came to £50 but the food was so worth it. Experience from start to finish was brilliant. Tried Casita for the first time on Thursday evening with a small group friends. We had several dishes to share and they all tasted delicious, the Tamal, Ceviche Casita and croquetas with chilli jam were our favourites. Cocktails were not second to the food though and if you like a drink with a 'kick' the Peru Bravo is a must. Relaxed service, not pushy but attentive. I can't wait to go back. Loved the watermelon salad, chicken and lamb mains where delicious. But the fireworks came with the desserts, the chocolate was stunning and the avocado was a revelation, just delicious. Will be back soon. Visited three times since opening and we love it. Fresh food packed with flavour. Cool atmosphere this is a must. I heard great things about this restaurant so I took my husband a couple of days ago and it was fantastic. What a beautiful place. We had the avocado fritters and croquetas to start with, both really really good. The Ceviche Casita was superb, one of the best ceviches I've had in London. We also tried the maca lamb, chupe seco and my favourite the aji de gallina. The star of the night was the dessert though, the chocolate one was just delicious. After several recommendations, I've finally visited Martin Morales' new restaurant. 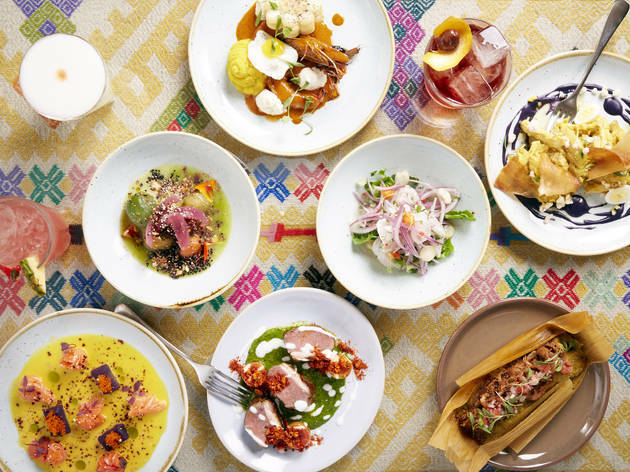 Casita Andina is a colorful and cosy picanteria where you can enjoy traditional peruvian tapas. The staff is very friendly and taking the time to talk through the menu and recommend the best dishes according to your taste. My friend and I had several small plates including the classic ceviche which was beautifully set and seasoned, pulled chicken and corn polenta with avocado and poached egg which were a bit disappointing in terms of flavour. However, their avocado and strawberry with meringues dessert was a real surprise mixing in the same time crunchiness and softness. I would definitely coming back to Casita Andina to try their evening offering more dishes options. 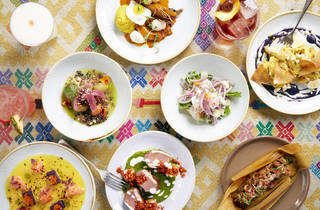 The new tapas style joint from Andina chef Martin Morales in Soho. The service was a little slow and confused but I guess that's acceptable in the first weeks of opening. 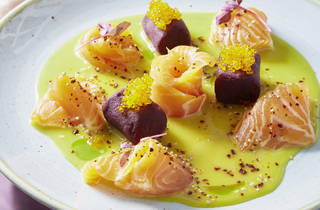 The trout tiradito was a highlight, it tasted really really good, although I found it a little too salty. The ceviche was good as Andina usual and the dessert of avocado and strawberry was light and nicely sweet. I would definitely go back to try more dishes from this Peruvian kitchen. 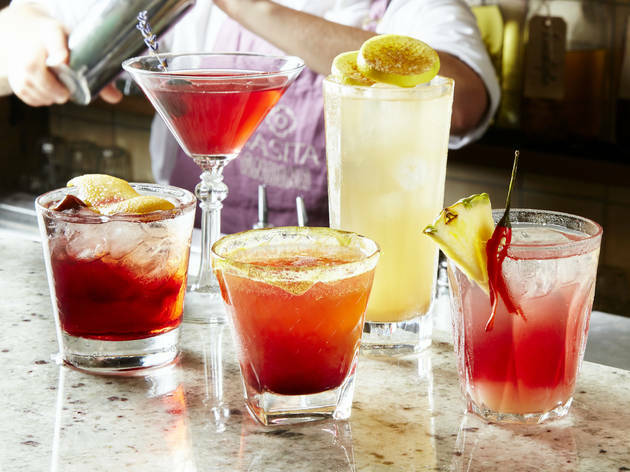 Casita Andina is the new restaurant of the Ceviche chain. Everything could be perfect. The staff is really nice and helpful, the decoration is colorful, the cocktails original, the dessert even more! But I was disappointed by the choice on the lunch menu. Except the so good (but so known) ceviche nothing really made me hungry. I finally tried some chicken and took on the side some fried avocado. Nothing special there, the chicken was not really tasty, just a pulled chicken with some spices which did not convince me. Nothing else to say about the avocado. My friend opted for the ceviche - prepared perfectly fortunately - and a mais polenta. The mais polenta was quite original by its sweet taste but not my favorite. The good surprise of the lunch was the dessert! Strawberry and avocado with some cream and meringues. Really really good, I'd recommend you to try it!